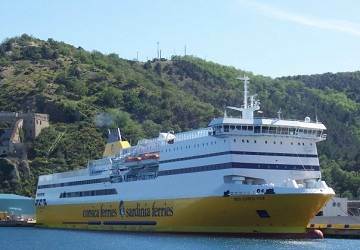 Built in Germany in 1995 as the Superfast II for Superfast Ferries, this ferry was purchased by Corsica Sardinia Ferries in 2006 and subsequently renamed Mega Express Four. You’ll find numerous onboard amenities including 200 en-suite cabins housing around 680 beds, reclining seats, a shop, a la carte and self-service restaurants, bar, swimming pool and solarium. 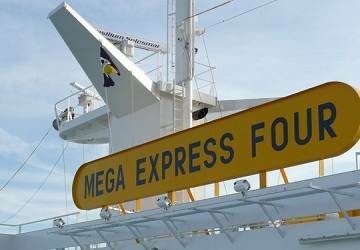 Please Note: Whilst we have taken great care in making our Mega Express Four guide as accurate as possible, onboard facilities, services and entertainment may vary depending on the date and time of year that you travel, facilities mentioned may change without notification and ferry companies reserve the right to operate vessels other than those mentioned at time of booking without prior notification. It was a great trip and would consider repeating if I was visiting Corsica again. The only thing I would perhaps change is that I wouldn't pay to reserve seats. We did but then spent the trip sunning ourselves or in one of the dining areas, playing scrabble. With a decent choice, the food was ok.
Good experience with this company, affordable and friendly staff. Travelled with Corsica Ferry from Nice to Corsica. Went well, punctual, good accommodation. The crossing was well organized. However, the cars were parked just far too close to each other. It was impossible to get tothe driver's side. When leaving the ship in Bastia, we had to wait half an hour because one of the vehicles had a defect. The cabins were neat and comfortable. The restaurant staff and reception staff were very helpful and friendly. A great experience! The staff where a bit pushy to get us out of our cabins in the morning. This was a pleasant trip. Seats comfortable. Good dining options- snacks, self serve buffet & restaurant. The dining options on this trip are superior to what Tirrenia offers on its overnight Cagliari to Palermo trip. We did this after the Nice-Bastia trip. The perfect crossing between Corsica - France and Corsica - Italy and vice versa. Booking through Directferries went well but the tickets needed to be printed on arrival in Bastia. The trip was smooth and without any problems. All is well organized and efficient. The ferry is overall clean and the staff is nice. The reclining seats could use some reparations. "Why does it have to be so cold?" The ferry left Toulon two or three hours late so I was very tired when I went on board and it didn't occur to me I'd need a sleeping bag to keep warm. I've very seldom felt so cold - I had to take a walk around the ferry every hour through the night to keep my blood circulating. It's good value, but I can't see why it needs such intense air conditioning. The port of Nice is very hard to access at noon, which may cause delays. The journey on the calm sea was relaxing and the drinks on board were delicious. Everything is perfect. It's clean and people are kind. It was my first journey with Corsica Ferries for Ajaccio and everything was perfect. It was like a short cruise. Thank you. I'll come back again. It was our first time with this company. Great crossing. The port in Nice is very busy and not very well sign posted. The ferries were pleasant and spacious. Conclusion: we would choose this company again, but from a different port. "A crossing with Corsica ferries"
Our crossing with Corsica ferries went well and was very pleasant. We didn't have to face strikes like SNCM clients. The crossing would have been great if the AC hadn't been so cold in the ferry.